A good rally on markets today based on the optimism from around the world on economic recovery measures and hopes of favorable outcome from RBI monetary policy later this month. Banks primarily rallied due to this. Global markets are positive and at the timing of writing this Dow is rallying by more than 125 points. As I wrote yesterday in yesterday’s pre-market call, ICICI and SBI rose along with banking sector as a whole. IT is still strong, TCS, HCL Technologies all could go up, Infosys is showing some weakness. In Pharma space, Cipla could further move up. Tata Steel and Reliance rebounded from the lows as expected and could begin a new uptrend which will be confirmed based on tomorrow’s market. For tomorrow’s trade, I recommend the following. 2. L&T – Buy only above 1400 for 1410 followed by 1425. 5. Reliance – Achieved my target of 830 today, the stock will gradually move to 860 in coming sessions. For tomorrow buy above 836 for target of 842- higher. Enter only after 15-20 minutes of market opening to avoid getting trapped on gap up. Below the levels mentioned, the stocks may be considered for short selling if markets start moving down. Please look at charts and simple indications like MACD bearish cross, falling RSI, MA bearish crossover etc to identify opportunities to sell. Refer my old posts to get such examples. To be trade in future or in cash? All my levels are in cash. do you not provide SLs for your recommendations anytime? Hi, I sometimes mention specific SLs for longs. 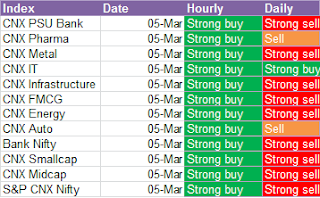 My recommendations are only for intraday most of the times. In todays recommendations, all the buy above levels mentioned are the SLs. For eg. Tata Steel- 346, L&T - 1400. If you are long and the stock goes below these levels, you have to exit. Most important point is - when you look at the charts and you see simple negative indications, then also you have to exit even if your SL is not hit. I will be including some detailed lessons in the site at a later date. thank you for your prompt response. Though I am not a proficient reader of charts I will continue to read the contents of your blog to develop better understanding. I truly appreciate your efforts. Thank you! You have to learn to understand basic chart reading, otherwise you are like somebody who drives without knowing the driving. The objective of my website is also to educate basic technical analysis to common man. You should start learning and then see the difference. I am working on it already & your blog is quite handy in providing the info I am looking for to further my learnings. Thanks!